Smoking cigarettes can be a difficult habit to kick. Some believe e-cigarettes are a safer alternative to smoking cigarettes and that they help smokers quit. They are designed to allow the smoker inhale lower nicotine doses when compared to cigarette smoke. E-cigarettes are also called vaporizer cigarettes or electronic cigarettes. They are basically battery-powered cigarettes with refillable cartridges. About one in six cigarette smokers will also use the e-cigarette device. There is no good evidence that they help smokers quit, and there are some downsides that e-cigarettes cause the body harm. Although some e-cigarettes emit a non-nicotine solution, other devices still have concentrations of nicotine between 24 and 36 milligrams per milliliter. E-cigarette studies have found that the devices contain hazardous substances besides nicotine, such as chromium and nickel. A new study published in the journal Oral Oncology now suggests that certain chemicals in two popular brands of e-cigarettes can lead to cancer-related cell damage. The damage even occurs in e-cigarettes that are nicotine-free. “Our study strongly suggests that electronic cigarettes are not as safe as their marketing makes them appear to the public,” explained the study research team at the VA San Diego Healthcare System. 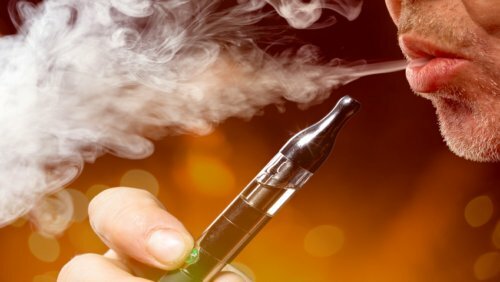 For the study, the researchers applied vapor extracts in a petri dish from the two e-cigarette brands to healthy human cells that line glands, cavities, and organs called epithelial cells. One of the two vapors contained nicotine. The researchers discovered that the e-cigarette vapor extract-exposed cells had a greater likelihood to suffer DNA death or damage than the cells not exposed with the vapor. The vapor-exposed cells showed DNA strand breaks that are known to lead to cancer. The exposed cells are also thought to lead to cell death and possibly cause internal poisoning or injury in the body. These effects still occurred with the nicotine-free e-cigarettes, suggesting that other chemicals are present in the devices that lead to the cell damage. Chemicals in the e-cigarettes that may contribute to the problem include formaldehyde and diacetyl. “Based on the evidence to date, I believe they are no better than smoking regular cigarettes,” concluded co-lead study author Dr. Jessica Wang-Rodriquez, a pathology professor at the University of California-San Diego. The research team explained that the study had some limitations. For instance, the human cell lines in the study do not fully compare to living human cells. In other words, there is a chance the vapors from e-cigarettes will effect the body differently. Also, the researchers didn’t use a normal vapor dosage that users would regularly be exposed. The researchers also note that further research is needed on the potential carcinogenic effects of the e-cigarette vapors. Other studies will determine what e-cigarette vapor dosage will cause the DNA damage. In a previous study presented at the European Respiratory Society’s Annual Congress 2012, researchers from the University of Athens, Greece, determined that e-cigarettes were detrimental to the lungs. The results found that the device caused an instant airway resistance increase. It lasted for 10 minutes in most of the 32 participants in the study. The e-cigarettes significantly raised airway resistance in current smokers, non-smokers, and asthma or chronic obstructive pulmonary disease (COPD) patients alike. Some natural remedies that are thought to help a smoker quit include lime juice, licorice, lobelia, ginseng, passion flower, valerian, green oats, cayenne, red clover, fava beans, carrot, and turmeric. Homeopathic remedies can also help a smoker detox. Some natural remedies include tabacum and loberlia, nux vomica, caladium, ignatia, plantago, and staphysagria. Wang-Rodriquez, J., et al., “Electronic cigarettes induce DNA strand breaks and cell death independently of nicotine in cell lines,” Oral Oncology, 2016; 52: 58-65, doi: 10.1016/j.oraloncology.2015.10.1018. Whiteman, H., “Study links e-cigarettes to cancer-related cell damage,” Medical News Today web site, December 30, 2015; http://www.medicalnewstoday.com/articles/304566.php. “Cell harm seen in lab tests of e-cigarettes,” U.S. Department of Veterans Affairs web site, December 28, 2015; http://www.research.va.gov/currents/1215-8.cfm.